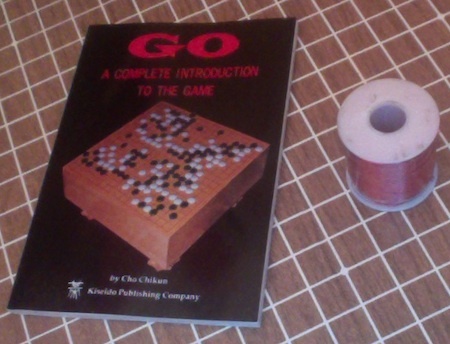 Today I received two packages at home: The book “Go: A Complete Introduction to the Game” by Chikun Cho, and a one pound spool of 32 gauge magnet wire. That last comes out to 7860 feet of 1/125 inch thick wire. I’m guessing it will be enough. Each of these two objects will be put to use in projects I’m working on, and I am very happy to have them. Yet getting these two things on the same day, and thinking about all the ways they contrast with each other, creates its own jumble of thoughts and possible directions. The Go book is, in a sense, a thing of pure thought — a physical object dedicated to an abstract idea. The spool of wire bends matter into a thing of pure possibility. When used in the right way, it is a way to connect the physical and the intentional. Here you can see them lying on a Go board. Its regular grid seems to connect these two very different objects in some strange yet logical way. What sort of project would make use of both a mile and a half of magnet wire and a book about the history and strategy of the most elegant of board games? Maybe I will end up with a robot that plays Go. This entry was posted on Saturday, August 31st, 2013 at 11:22 pm	and is filed under Uncategorized. You can follow any responses to this entry through the RSS 2.0 feed. You can leave a response, or trackback from your own site.